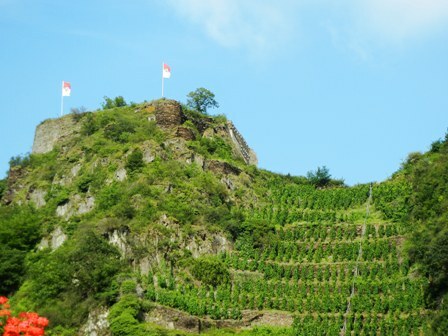 The Ahr wine region is well known for producing outstanding Pinot Noir wines in Germany. During a visit this summer we bought a bottle of ‘2009 Spaetburgunder Auslese dry’ from the Mayschoss Vintner Co-operative. The co-operative is the oldest in Germany. 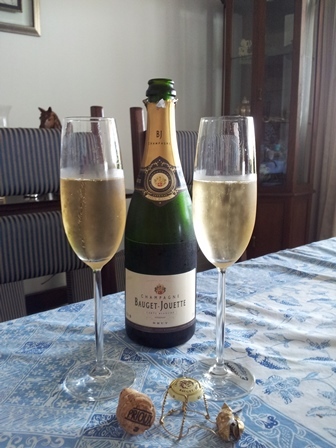 In 2012 one of it’s wines was awarded the best “Blanc de Noir of Germany” title by the food magazine „Der Feinschmecker“ (5/2012 edition). 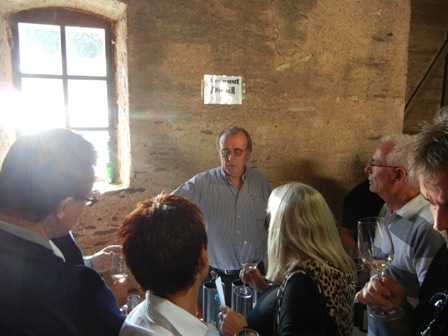 We visited the cellar door in August and had a guided tour which was very lovely. Recently I tasted the Mayschoss Pinot Noir together with my friend Juergen. The wine has a beautiful dark red colour. The black fruit aromas with a tiny hint of peach are lovely. The wine is medium-bodied, smooth and shows a fine balance. We drank it on a Sunday morning, just like that without food, what we call in Germany a “Fruehschoppen”, a drink (glass of wine or beer) taken after church, and before going home for lunch. Thanks Juergen and Elisabeth for the excellent company. I do not think that Australia has already embarked on this path, but Germany certainly has a long tradition of wine queens and wine princesses (since about the 1930s). The German wine queen is the elected representative of German wine for the duration of one year. The candidates are the 13 regionally elected wine queens from the officially recognized 13 wine regions. It is tradition that the new wine queen will be crowned in Neustadt, Pfalz. The 64th German wine queen is Julia Bertram from the Ahr win region. She was inaugurated on September 29. The German wine princesses (allowed are up to three) are the deputies of the German wine queen. Usually the runner-up in the election is appointed wine princess. Currently there are two, Anna Hochdörffer, Pfalz, and Natalie Henninger, Baden. The electoral college consists of about 70 members. I could neither find out how the selection committee is composed nor how these jury members are selected, though. From the 13 regional wine queens, normally six are nominated as finalists for the contest. The jury elects one as queen and two as her princesses. Of the 64 queens, 11 came from my native Mosel. The candidates do not need to come from a winery or vineyard but need solid knowledge about German wine and the wine industry, oenology and wine-making. The wine queen and the princesses are representing the wine industry for a year at all major wine festival, fairs, exhibitions, wine tastings, including international events. They need to be eloquent and good ambassadors for the German wine industry. 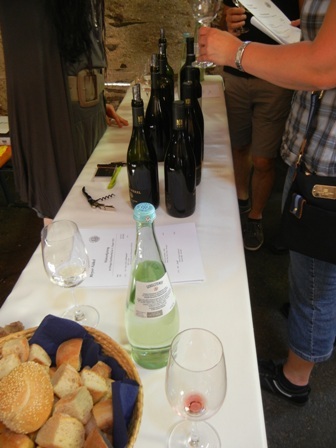 Let us come back to the Karthäuserhof estate tasting on August 11, 2012. It was a splendid summer’s day with blue sky and ample sunshine when we walked into the estate. We paid our entrance fee of 15 Euro/person. It was all very confusing for a first time visitor. Many of the other guests, it seemed, knew their way around. Lot’s of people had showed up. The wine tasting was conducted in two seperate locations. The first was a rather crammed barn with four tasting stations. I can only recall three of the wineries represented. The barn was packed with people, pushing and shoving along. The vintners behind their tables were equally, let’s call it – stressed. I immediately felt some regret. Why did I give up a perfectly spacious table elsewhere and a bottle of wine in a quite atmoshere, I aske myself. My first wine from Knipser I had tasted in Beijing, China, about 24 years ago, when my friend Norbert who is a native of the Pfalz, presented me with some dry Riesling from this estate. The family tradition of wine production in the Pfalz goes back to 1615 (an incredible long time in an Australian context). The Meyer-Näkel family, now in the fifth generation, has about 15 ha under vines, 75% of which are Pinot Noir, 12% early Pinot Noir, 5% Pinot Blanc, 5% Riesling and 3% others. One of the two daughters presented the wines when we were there. 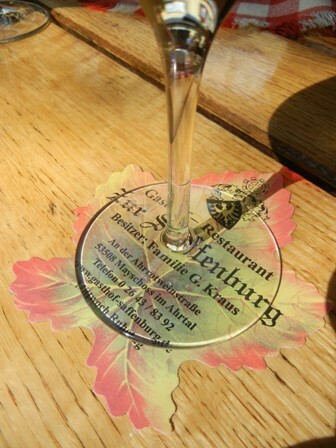 The Ahr is the northernmost (and the smallest) wine region of Germany and produces some stunning Pinot Noir wines. The vineyard is about 10.5 ha in size. The mainly white varieties (Riesling, Pinot Blanc, Chardonnay, Muscat, Scheurebe and Pinot Gris) are planted on a calcerous soil in four locations in Kallstadt (Saumagen, Annaberg, Steinacker, Kreidkeller). The first two wineries I know quite well. I have tasted wines from these producers at various occasions. The Koehler-Ruprecht estate was new to me. I admit that I do not know the village of Kallstadt near Bad Dürkheim. The webpage of Koehler-Ruprecht, however, is presenting the estate in five languages (German, English, Chinese, Norwegian and French)! And now the bad news: the crowded conditions did not lend themselves to note taking. Anyway, I was not in the mood while being pushed and shoved to think about anything, except: let’s get our of here as quick as possible. But then I also thought, Rainer, you should taste some of the wines. Which I did. I remember nothing, except that the grand cru Meyer-Näkel Pinot Noir was wonderful, and that the daughter behind the counter was very kind and friendly. We went to search for the second wine tasting station thereby recovering a bit from our claustrophobia. All good things come to an end. That applied also to our family vacation. From the Ruhr we made our way back to the Mosel region. Since we had some spare time on our hands, we decided that a short visit to the Ahr wine region would just be the right distraction. 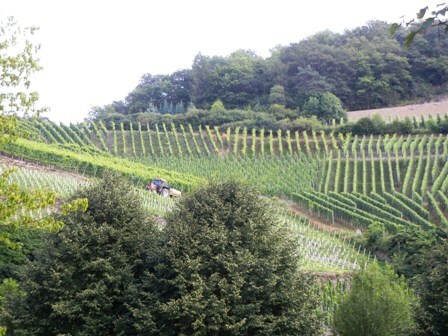 The Ahr wine region is one of the smaller wine region in Germany (about 600 ha under vines). Despite its northern location the Ahr wine region is dominated by red wine production (about 80%),and is most famous for its outstanding Pinot Noir wines. 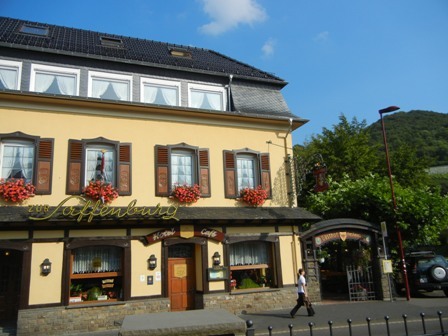 Since we were also hungry we dropped in at a counrty inn called Saffenburg in Mayschoss at the banks of the Ahr river. 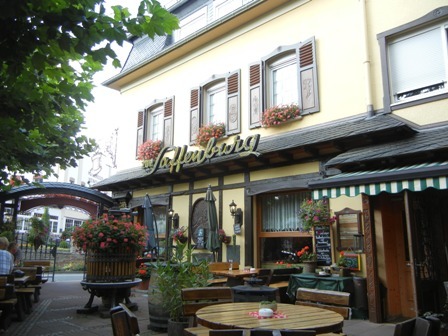 Mayschoss, a small settlement with about 1,000 inhabitants, is also home to the oldest wine co-operative in Germany (founded in 1868). 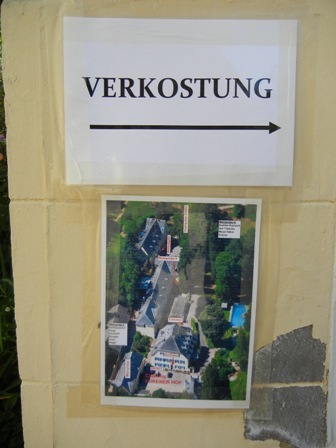 Today the Mayschoss-Altenahr Wine Co-operative as it is called, has about 400 members and covers 140 ha under vines. It’s cellar door is located opposite the country inn. The first thing I did was oder a glass of Pinot Noir made by one of the famous Ahr producers: Jean Stodden. This is the “ordinary” Pinot Noir produced by Stodden but a good specimen of what the Ahr has to offer in Pinot Noir. Unfortunately, we had no time for a tasting at Jean Stodden. Instead we planned to pay a short visit to the wine co-operative across the street after our meal. 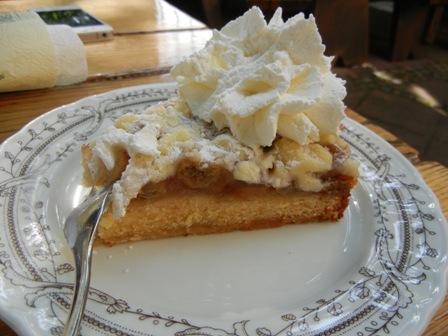 German cuisine has a lot of very tasty dishes to offer. 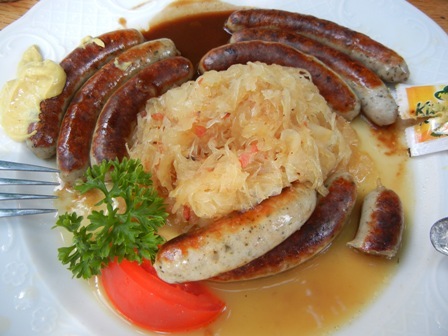 We went for Nuernberger sausages (photo above) and beef stew (photo below). Irresistable were the cakes on offer, together with a coffee, they concluded our meal. Needless to say that the food was delicious. We sat on the terrace in the yard. The service at the country inn is exceptionally good. Five out of five, I would say. We had a jolly good time on our last day of our excusion in Germany. I plan to also inform you about our visit to the wine co-operative in Mayschoss. Stay tuned. 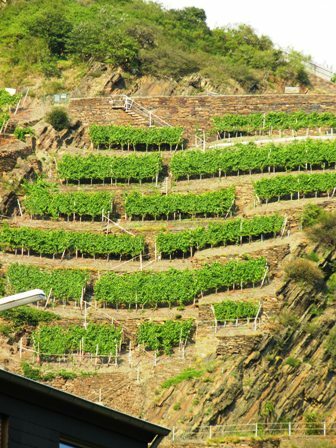 The Ahr wine region is a very popular destination for day travellers but also suitable for longer excursions. I highly recommend the “Rotwein-Wanderweg”, the red wine hicking path crisscrossing the region with breathtaking views of the vineyards and the small settlements. Ideal is to explore the valley on a push bike. Please also visit my blog entries from November 2007 regarding DAGERNOVA, another wine co-operative and vintage time along the Ahr. At a recent business dinner a dry Pinot Noir from the Ahr was served. 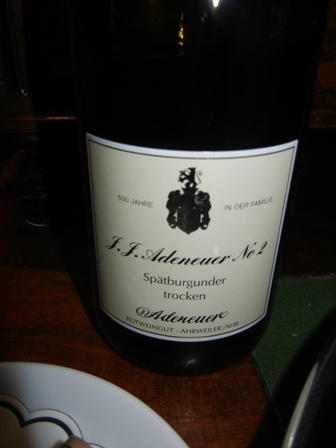 It was a ‘2009 Adeneuer No.2 Spaetburgunder dry’ by Weingut J.J. Adeneuer in Ahrweiler, Ahr. The ‘2009 Adeneuer No.2’ costs about Euro 16.- to 17.-, and is a ripper of a German Pinot Noir. Since my main course was a fish dish, I had chosen the Riesling wine (more about this later), not a difficult choice for a Riesling aficionado like me. 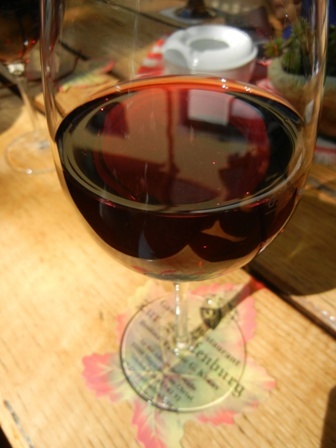 But later in the evening when the dinner dragged on, I also had a good look at the red wine served with the food. 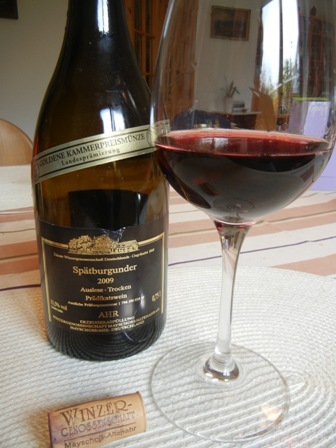 I love the Pinot Noir wines from the Ahr, the smallest wine region in West Germany, therefore I had to taste it. When I was a student at Bonn University we would sometimes skip some lectures and go on a spontaneous trip to the Ahr river. 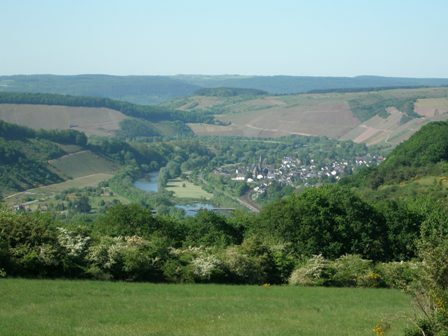 The Ahr valley is a very romantic place, a little jewel for a young student in love with life and everything. Because of the darkness of the dining room, I could not verify the expected pale red colour of the Pinot Noir. The aromas were dense and fresh, strawberries and other red berries came to mind. The wine is medium bodied with fine tannins, a very good structure and a long finish. I found ratings on the internet between 17 and 18 points (on the 20-point scale). 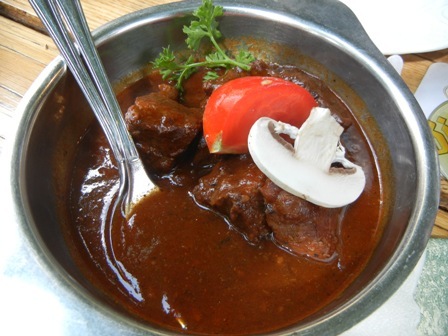 I wished I had ordered some red meat as well….. The other day Lufthansa celebrated it’s 50 years of scheduled flight services to Bangkok, Thailand. I was invited to a function at the Mandarin Oriental Hotel which provided not only a splendid backdrop to the event but also supplied the guests with very jummy culinary delights. Also the wines, a red and a white, both from Germany, were first class. Lufthansa served a 2008 Spätburgunder from Meyer-Näkel, Ahr and a 2008 Riesling from Hermann Dönnhoff, Nahe. What a treat. I could not believe my luck. When I was a student of agriculture at Bonn University, one of my fellow students, came from the nahe wine region. She had a sticker on her car reading: “Nahewein ein Edelstein”, freely translated as “Wine from the Nahe a gemstone” (unfortunately this does not rhyme as the German slogan). Both wines were gemstones, indeed. In the end the Riesling somehow blended better with the food, a mix of Thai, German, and other cuisines served in small portions in a snack-type fashion. The anniversary was celebrated in style with beautiful visualizations (among them old photos from good old Bangkok), street food, a twist dancing group, sepia photo taking, a choir and other singers. I wish Lufthansa many more successful years with their venture in Thailand. PS: I did not bring a camera and therefore do not possess any photos. I also somehow forgot to study the labels of the bottles carefully. That’s a cumbersome affair for me if waiters are serving. Its certainly a great honour to be called “vintner of the year”. Since 1994 Gault Millau, Germany’s wine guide and major authority regarding wine, wine business and the wine sector, is awarding the “vintner of the year” award. Today the total number of vintners of the year is 16, seven of which come from the Mosel wine region. The current one, however, comes from the Pfalz (Knipser brothers). But in the years 2007 (Theo Haart, Mosel), 2005 (Kartaeuserhof, Ruwer), 2001 (Loosen, Mosel), 1998 (Mueller-Scharzhof, Saar), 1996 (Joh. Jos. Pruem, Mosel), 1995 (von Schubert, Ruwer) and 1994 (Fritz Haag, Mosel) the vintner of the year came from my home, the Mosel river and its tributaries. No other German wine region has provided that many “champions”. So far the Nahe and Pfalz wine regions had two vintners of the year; and Rheinhessen, Rheingau, Frankonia, Ahr and Baden had one each (for the names of the vintners of the year: Gault Millau). I came about this fact only by accident while researching a story, I was going to write. I have to find more Mosel wines here in Bangkok, I guess. Wish me luck.